On April 12, 1945, Corporal Ichirō Kidokoro took off from Chiran Air Base and died in a special (suicide) attack west of Okinawa at the age of 20. He was a member of the 103rd Shinbu Special Attack Squadron. He piloted a Type 99 Assault Plane (Allied code name of Sonia). After his death in a special attack, he received a four-rank promotion to Second Lieutenant. 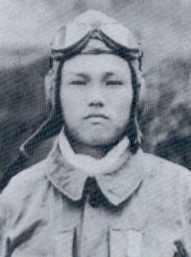 He was from Aichi Prefecture and was a member of the 14th Class of the Yonago Pilot Training School. I thank you for raising me for more than twenty years. I have no regrets at this last moment. I only request that I die splendidly. Thank you for the many ways that you have taken care of me. I earnestly ask you to take care of things afterwards. The letter and biographical information on this page come from Chiran Tokkō Irei Kenshō Kai (2005, 108, 186) and Osuo (2005, 203). 1. Kidokoro may have had more than one older brother or more than one older sister. The numbers are not specified in the letter.